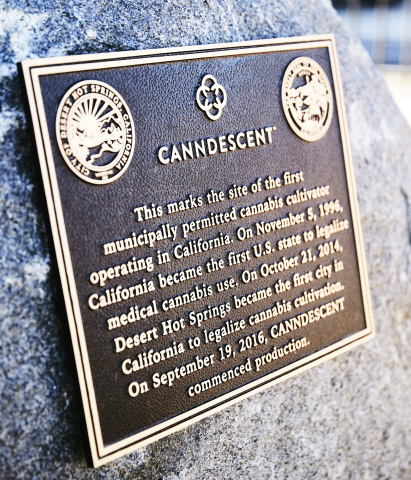 Cementing its role as an industry trailblazer, Canndescent™ has completed the cannabis industry’s first, commercial-scale solar project, powering its indoor production facility in Desert Hot Springs, CA. Delivering onsite, renewable energy, the 282.6 kilowatt system uses 734 solar modules on seven different carport structures to energize the company’s historic cannabis production facility, which also earned attention in 2016 as California’s first municipally permitted operation. The state-of-the-art, clean energy system offsets as much carbon annually as a 430-acre forest and reduces annual atmospheric carbon emissions by 365 metric tons (per NREL and EPA estimates). As the first cannabis company to power an at-scale, indoor cultivation project with renewable solar energy, Canndescent provides a critical template for sustainability in an industry where outdoor growers tax water resources and indoor and light dep greenhouse growers consume an estimated 1% of the electricity produced in the United States. The project currently produces enough power to charge an estimated 20% of US smartphones for a day and highlights a potential path to divorce agriculture from many of its negative environmental impacts. Cultivating indoors with solar power, the project marries the crop turns and water efficiency associated with indoor, hydroponic cultivation and the energy efficiency found in other forms of cultivation. Historically, the cannabis industry has chosen between indoor, outdoor, and greenhouse approaches. With the first-of-its-kind solar project, the company creates a fourth choice it calls greendoor™ that unites water efficiency, energy efficiency, and pesticide-free growing in an indoor format.